CHICAGO — The judges assigned to score the rematch between GGG and Canelo Alvarez each received $2,500 for their efforts, a small pinch compared to the estimated tens of millions both fighters will earn once the pay-per-view buys are paid and apportioned. While the verdict was condemned by some quarters, most notably and loudly by ESPN’s Teddy Atlas and Stephen A. Smith, we can all agree that the official scorecards of Dave Moretti, Glenn Feldman and Steve Weisfeld reflected the universal opinion that it was a close battle which could have tilted either way. Kudos to the referee, too. Benjy Estevez officiated a clean fight and got out-of-the-way as the third man on the ring should. He definitely was worth his $5,000 payday. 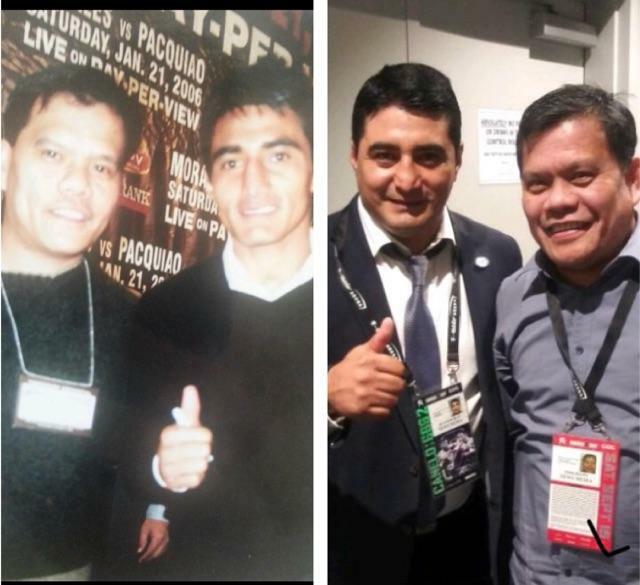 I first met Erik Morales in January 2006 when he fought Manny Pacquiao in the second installment of their storied trilogy. Since his last fight on October 2012, a fourth round KO at the hands of Danny Garcia, El Terrible has since retired, ending his Hall-of-Fame career with a record of 52-9 (KOs). And while he is no longer encumbered by the intense rigors of boxing, he is not out of the fight game completely. He trains fighters occasionally and lends his expert opinion to Fox Sports TV during big fights. I ran into Morales hours before the GGG-Canelo rematch at the television broadcast suites by the press box at T-Mobile Arena. Now 42 he looked like he can still go 12 rounds But I only needed a couple of minutes of his time, and he was nice enough to oblige. We talked about the upcoming Pacquiao-Mayweather fight, his life outside and ring, and our shared passion for San Miguel beer, a brewing giant that he once endorsed while he visited the Philippines. He was always a class act way back when. He still is now. For many years, Filipinos in Las Vegas and all throughout the world, would gather around for watch parties every time Pacquiao had a date on the ring. But the Filipinos’ love for boxing isn’t exclusive to Pacquiao. We also love Golovkin and Canelo, pugilists who ignore pain and suffering to entertain blood-thirsty fans. So it was no surprise that multiple watch parties took place in the desert last Saturday. And I had the pleasure of attending one with my brethren. As soon as the post-fight press conference was over I quickly fetched an Uber for North Las Vegas to the Cabigon household, where one of the city’s most prosperous parties took place. The hosts were PhilBoxing.com writer P.J. Cabigon and his lovely bride, a model disguised as an accountant, Angelie Mae Cabigon. Along with PJ’s mom, the ageless Nieva, they were joined by 75 of their closest friends. A very dead pig — seasoned and roasted to golden brown perfection — was the main entrée’. Shrimp was plenty, beef was abundant, and fish made an appearance. There was enough food to feed Darfur. At age 50, I try watching what I eat now so I was being moderate and finished only five plates. More importantly, P.J. served more alcohol than Binny’s liquor store. Some guests played it safe with harmless wine. Most of the boys swam with beer. The older dudes dueled with the hard liquor such as Bacardi and Hennessy, before finishing with Tequila at sunrise. As usual, I defended the honor of sportswriters around the world as I drank like a heavyweight. There is talk of a third GGG-Canelo fight. I will go to Las Vegas again for that for sure. But only if there is another PJ-Angelie hosted watch party.